The roller shade has been around for years, and, with the updates Hunter Douglas continues to add, they’ll be around for years to come. Without question, today’s updated, spring-loaded roller shade by Hunter Douglas is setting a new standard for this time-tested classic. 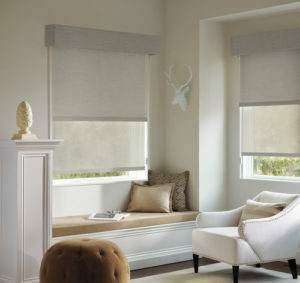 At Treasure Coast Window Fashions serving West Palm Beach, we’ll be happy to show you the roller shades in action. The one drawback to roller shades has always been the light gap that comes from the sides of the shade when installed inside the window frame. One side of the roller shade has a clutch to raise and lower the shade. As a result, the fabric on the control side leaves a light gap for the clutch to operate. Now, Hunter Douglas has figured out how to create a smaller light gap for roller shades. They created an ultra-slim system called custom clutch, which is attached to the bracket. With this system, roller shades now offer the smallest light gap in decades. In the past, the control clutch was attached to the shade which added to the larger gap. This changed and streamlined clutch allows the fabric of the shade to be cut larger for better coverage. High-Quality Craftsmanship: Backed by a Lifetime Warranty and the Right Choice Promise™ you’ll have peace of mind when you invest in Hunter Douglas Window Fashions. Treasure Coast Window Fashions provides more than just the finest window coverings. Our owners are involved in every project from start to finish to ensure your window covering project exceeds your expectations. We’re proud to serve the greater West Palm Beach, North Palm Beach, Tequesta, Hobe Sound, Indiantown, Jupiter, FL and surrounding area. Please contact us at 772-220-8870 or visit our showroom in Stuart, FL, for more information about our products and services. Contact us to learn more.